What a fabulous response to Toru Takemitsu’s “From me flows what you call Time…” performed by NEXUS with the Rochester Philharmonic Orchestra under the direction of Peter Bay. The reviews are in, and…my oh my! Jeff Spevak, music critic for The Democrat & Chronicle, says “the night belonged to the sparkling collaboration between the RPO and NEXUS” and calls Maestro Bay “sprightly” and “the perfect man for this job, with an intimate knowledge of all the working parts on this weekend’s construction.” He also points out that Peter Bay conducted the RPO and NEXUS on the 1994 album, Voices. 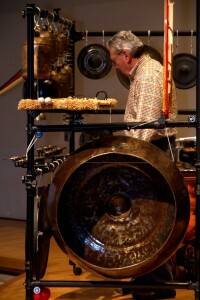 Spevak provides a lovely description of NEXUS as they “worked with bells, bowls, drums, gongs, cymbals and all manner of clattering and shaking objects dangling from racks set about the stage, alongside wood blocks, vibraphones and glockenspiels” and the RPO as it “laid down a lush soundtrack…. It closed with the shaking of chimes hanging from racks, producing a rainfall of tinkling notes that slowly faded until only one stubborn little chime remained … ringing … ringing … barely perceptible, until it too was gone. And only then did the patient audience in the Eastman Theatre break into applause.” You can read all of Jeff Spevak’s review by clicking here. Paloma Capanna reviewed the event for the City Newspaper and painted an equally interesting “word picture” of the stage set-up, concluding with, “On each front wing of the stage was a tall, wide bar, supporting more than 20 long chimes. The metal instruments were made of all types of metals, thickness, shape, and sizes.” And when she described the NEXUS percussionists themselves, she does so with a photographer’s eye: “Each percussionist moved as if taking part in a water ballet. The entire arc of their bodies was part of the creation of the sound.” She describes Bill’s “rolling thunder on a huge cymbal that began with the smallest of movement, but rose gently and surely through larger and larger movements, creating more and more sound until it started to recede to where he was barely moving, even as the smallest of sounds still penetrated to the upper reaches of the hall.” You can read all of Paloma Capanna’s review by clicking here.